To be found on Swan Street at this time were William Catchpole’s hatting firm; a herring and egg merchant; glass works; coopers; oyster dealer; banks; tobacconist; jewellers; Richardson the pawnbrokers, coffee shops and at number 20 – 22 Swan Street – musical instrument makers. 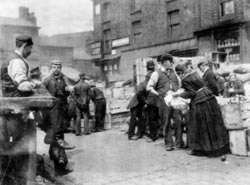 There was also the Rising Sun on the corner of Rochdale Road – a well established public house and music hall, the Burton Arms – still at number 31, and the Smithfield Hotel at the end of the row. Almost everyone knows that ‘The Band’ got its name because of the small stage high up on the wall that musicians used to perform on. But finally we can reveal how this came about. Florence Flanagan and Jack Brannigan – who later married – and who played at the George and Dragon in the late 1930’s, remember that the idea for a stage upon the wall came from Ernie Tyson, Flo’s uncle – in 1937, and that he installed the stage. 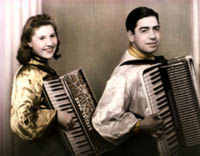 A regular band of two accordionists, piano, drums, singer and sometimes saxophonist would play. Key performers were Flo Flanagan (accordion and singer), Jack Brannigan (accordion), Jim Hart on drums, Saxophone Mick the Pole and Albert Mancini on piano. Italian accordion wizard Rudi Mancini, and the ‘Elvis of Ancoats’ Dominic Rea also played accordion at the Band on the Wall. Lawrence Kelly a fish merchant in the market played cornet. Floor singers sang in front of the piano or in front of Flo. There was no amplification and contrary to rumour there were steps up to the stage, not a ladder! Bands played 7.30pm till closing time with a couple of breaks, six nights a week. Always known as a rough place Ernie Tyson ran it with a rod of iron. Jack Branelli remembers that if there was any trouble ‘one punch from Ernie and they’d be on the cabbages’ – a reference to the vegetable stalls that lined Oak Street. The George and Dragon had table service and the waiters wore white aprons. It was immensely popular and known as a services pub during the war when Americans, Canadians, Australians, French as well as British soldiers, market traders, factory workers and shoppers all used it. Italian prisoners of war and deserters were rumoured to come in. Often the band carried on playing during air-raids ‘ especially when the raids became more common. By the middle of the twentieth century Swan Street was in decline. Many textile factories had closed and people moved out of the area. Market trade was down and the buildings were demolished in the early 1970s. The fortunes of the George and Dragon – or Band on the Wall as it was increasingly becoming known ‘ mirrored this slump. 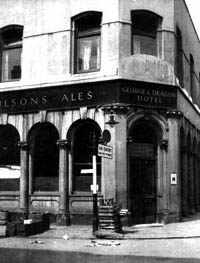 Drag acts such as Diamond Lil and Neville St Claire were popular in the late 1950s, but by the mid-1970s the George and Dragon was on its last legs.